In contrast to this, in the narayana dasha book, it is given other way round, as Agasthya related to Maharishi (sthira rashis) and Doorvaasa is related to Bhramarishi (chara rashis). Before venturing into the study of the finances of a nation we should be clear about the indications of the houses in the chart. In deva prasna (i.e. questions bearing on deities, the twelve houses signify (1) Divine presence, (2) wealth, (3) temple servants, (4) vehicles (5) image, idol, picture or symbol like an alter, (6) enemies, (7) ornaments, (8) offerings, oblations of five or sixteen kinds, (9) temple authorities, (10) festivals, (11) income and (12) expenditure. There are two methods to draw a Trimsamsa (D30) Chart. We discuss the method of Parashara. What is the Trimsamsa, and how to draw a Trimsamsa Chart? Trimsamsa means the one-thirtieth portion of a sign measuring one degree. Unlike other divisions, the Sun and Moon are not the Lords of any trimsamsa and the Nodes (Rahu & Ketu) also do not owm any trimsamsa. Thus the remaining five of Mars, Mercury, Jupiter, Venus and Saturn own the trimsamsa. Bhagavat Gītā: A few years ago when we were asked about the standard books for studying Jyotisa, the Bhagavat Gītā, Bṛhat Parāśara horā śāstra and Maharṣi Jaimini’s upadeśa sutra were recommended as the foundation. Kārakāṁśa is composed of two words – (1) ‘kāraka’ referring to the ātmakāraka specifically and other Charakāraka (temporal significators) as well and (2) ‘aṁśa’ referring to the navāṁśa and other divisional charts. 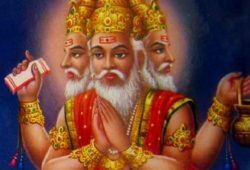 Brahma has four heads from which He spoke the four vedas – the Rig Veda, Yaju Veda, Sama Veda and Atharva Veda. 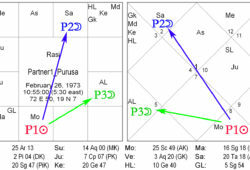 When the three guna (Satva, Rajas and Tamas) manifest, they do so in a combination such that either one of the three predominates or they are in a confused proportion where neither predominates. “Sama-Saptaka” means mutual seventh and refers to the placement of two ‘otherwise friendly planets’ in mutual one-seventh houses from each other. The placement of two diremalefics in such places is not considered ’sama-saptaka’. There is a need to review the calendar system used in Vedic astrology and to set the standards for the right calendar to be followed in this regard. There have been various calendar reform committees set up in various forum, yet there has not been any consensus as deep inside they realize that some vital point is being missed out. The calendar being followed by the Indian Government, is widely off the mark as it just blindly superimposes a lunar calendar on a solar calendar! Without trying to harmonise them as had been originally done by the Vedic Seers. continued from Sambandha#1. The case studies done as a part of the discussions in the previous paper are listed here. 1. For Graha Ārudha, count from the planet to its own sign. Then count as many signs from this own sign. The sign arrived at is the Graha Ārudha.